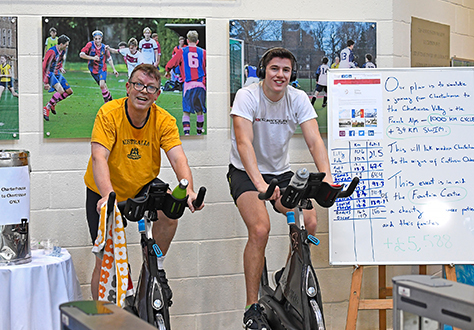 In an event last weekend, pupils and staff from Daviesites cycled and swam the equivalent of Charterhouse to Chartreuse in aid of the Fountain Centre at the St Luke's Cancer Centre at the Royal Surrey Hospital. They exceeded their target, raising over £11,000 for the Fountain Centre. The distances covered were 1,416 lengths of the School pool and 1,000 km on exercise bikes. We would like to offer a special thanks to the pupils who bought in so readily to this event, and especially our charity monitors Thoran Landers and Adam Sousanne. Our year group coordinators Tom Kinmont, Charlie Church, Will Barraclough and Andres Bartlett also did an excellent job. Well done to all involved for the fantastic effort.